So it’s 1954 your a Canadian Aerospace contractor and your contacted by the US Air force to build this what do you do? Well apparently this really happened, the US Air Force recently declassified documents that give detailed information about the Canadian UFO or Project 1794 as it was codenamed. Avro Aircraft of Ontario, were the company contacted to build the Canadian UFO, Avro Aircraft are now a non entity but were famous for a short time for Their Arrow project, a supersonic fighter aircraft whose production was ended suddenly in 1959. They were trying to create an advanced strike vehicle that could still operate without the need for a runway and could land on any flat surface equal to or larger than it’s circumference. Avro did build a little flying car called the Avrocar in a contract for the Army, this was supposed to be a low-flying VTOL aircraft. But the Avrocar was very unstable and the project was scrapped in 1961. There were a lot of UFO sightings around this period in History could some or all of them of been glimpses of the Canadian UFO? Or is this document and a complete fallacy created to make us think exactly that? 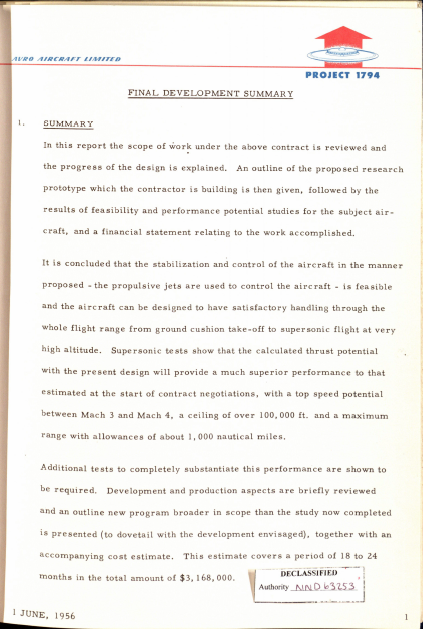 Below is a copy of the Final Development summary for the Canadian UFO Codenamed Project 1794. If this is true were other countries also trying to build UFOs or other craft similar to the Canadian UFO? 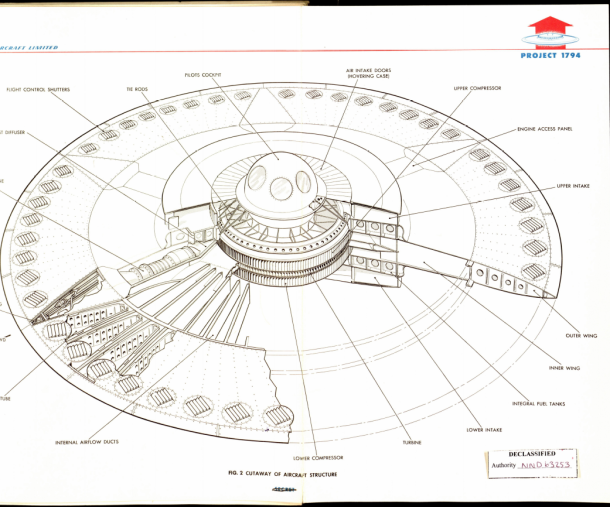 Are the governments of the world just trying to throw us of the scent of real UFOs, was there a real Canadian UFO made? And if so did it ever fly?